Leach's letter signaled the beginning of the 1863 phase of the peace movement in North Carolina, marked by the development of the Peace Party. Between July and September, about 100 political rallies were held across the state at which speakers expressed their discontent with Confederate rule and advocated various proposals for peace. Two-thirds of the peace meetings were held in the central Piedmont, where independent yeoman farmers were common and support for slavery was weak. At a few of these meetings ardent Unionists hoisted the U.S. flag. Some peace advocates called for Richmond to arrange a peace based on Confederate independence. One faction urged that a convention of all the Confederate states convene and negotiate a peace with the North, while another called for reunion with all constitutional rights guaranteed, including the right of slave ownership. William W. Holden, editor of Raleigh's North Carolina Standard, emerged as the leader of the state's peace movement. He printed accounts of its meetings and supported it editorially. In the 1850s Holden had been an ardent secessionist, but during the secession crisis of 1860-61, he became a Unionist. When North Carolina seceded, he supported the new Confederacy and became Governor Zebulon B. Vance's chief spokesman in the press. Unable to prevent Holden from endorsing the peace cause, which he regarded as likely to lead to a civil war within the Civil War, Vance broke his political ties with Holden and denounced the peace movement as dangerous and subversive. On 8 Sept. 1863 rioting Confederate troops, believing Holden a traitor, sacked his newspaper office. The next day, Vance issued a proclamation denouncing the peace meetings. These acts marked the end of the 1863 phase of the peace movement. The peace movement emboldened deserters, draft dodgers, and militant Unionists, hundreds of whom congregated and organized into bands in the central Piedmont in the summer of 1863. By August, these armed bands roamed the central counties at will, defying both state and national authorities. Faced with an insurrection, Vance sought aid from Richmond, and Gen. Robert E. Lee ordered a brigade of Confederate troops led by Brig. Gen. Robert F. Hoke into central North Carolina. On 8 Sept. 1863 Hoke's troops arrived by train at High Point, a railhead in southwestern Guilford County, the heart of "deserter country." What followed was one of the largest deserter hunts carried out in the Confederacy. Vance ordered out hundreds of state Home Guard and militia troops to support Hoke's force. For five months these Confederate and state troops scoured the central Piedmont from Wilkes County in the west to Chatham County in the east. Thousands of deserters and draft dodgers were captured and forced into the ranks. Meanwhile, in the fall of 1863 six of the ten congressmen seated from North Carolina had campaigned on a peace platform. Although only three of them were allied with Holden, all advocated an "honorable peace." 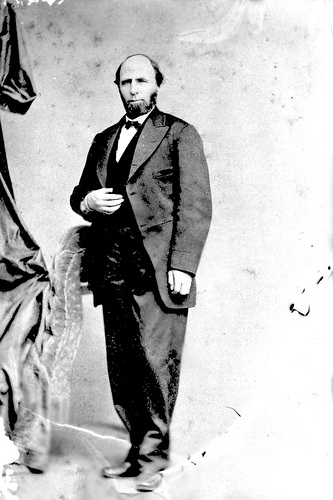 Believing that the election results reflected strong grassroots support for his peace policy, Holden reactivated the Peace Party in January 1864. He knew that Jefferson Davis would never assent to any peace short of Confederate independence. But by 1864, Holden and many others had become convinced that the South could no longer hope to "conquer" a peace. They concluded that the only way to overcome Richmond's intransigence and prevent defeat, emancipation, and Federal military rule was to call a convention of all the Confederate states or, failing that, hold a state convention to consider peace negotiations. Thus began the third phase of the peace movement. Alarmed at the rebirth of the Peace Party in North Carolina and the determined drive by its adherents for a state convention to supersede the Confederate president and Congress in negotiating a peace with the Federals, Davis asked the Congress to grant him authority to suspend the writ of habeas corpus. In February 1864 the Confederate Congress passed a law giving him the power to do so in 13 instances. The instance pertaining to the peace advocates denied the writ to any person arrested for "advising or inciting others to abandon the Confederate cause, or to resist the Confederate states, or to adhere to the enemy." Suspension of the writ spread terror through the ranks of peace advocates, and an intimidated Holden ceased publication of his newspaper. But the editor soon regained his courage and announced on 3 Mar. 1864 that he would run against Vance in the August election. If elected governor, Holden promised, he would "do everything in my power . . . to secure an honorable peace." A gifted and popular orator, Vance largely preempted Holden's position, which championed state rights, civil liberties, and peace, by strongly advocating the same principles. But Vance made it clear that the peace he spoke of must be based on southern independence. Due to Vance's appeal to the common man, the suspension of the writ, the stationing of troops at polling places on election day, the use of color-coded ballots, and other forms of intimidation, the incumbent won by a landslide. Gov William W Holden 1865. Photo courtesy of the North Carolina State Archives, photography call #: N_53_15_1566. Available from http://www.flickr.com/photos/north-carolina-state-archives/5553947446/ (accessed May 15, 2012).